(leading to ExpertRating LSAT Preparation - Course 2 Certification). Taking both part 1 and part 2 of this course will prepare you to perform well on all three question types on the LSAT: reading comprehension, logical reasoning, and analytical reasoning. You will practice on actual LSAT exams from previous years and also learn test-taking techniques developed by The Center for Legal Studies and taught to thousands of prelaw students around the world. LSAT Preparation - Part 2 provides an intensive review of reading comprehension and logical reasoning questions, including techniques for quick elimination of incorrect answers, explanations and interpretations of correct answers, and proven approaches for selecting the correct answers. Part-I of this course is also available. Both the courses can be bought either separately of collectively by paying the requisite fees of $129.99 each. This course includes a knowledgeable and caring instructor who will guide you through your lessons, facilitate discussions, and answer your questions. The instructor for this course will be Scott and Lisa Hatch. About the ExpertRating Online LSAT Test Prep Course-II instructors : Scott Hatch has presented paralegal courses since 1980. He is listed in Who's Who in California, Who's Who Among Students in American Colleges and Universities, and has been named one of the Outstanding Young Men of America by the United States Jaycees. He was a contributing editor to The Judicial Profiler (McGraw-Hill and the Colorado Law Annotated (West/Lawyers Co-op) series, and editor of several award-winning publications. He is author of Paralegal Procedures and Practices, published by West Publishing, as well as books on mediation and legal investigation. LSAT Preparation - Course 2 Course requirements: For taking this instructor led ExpertRating Online LSAT Test Prep Course-II you need Internet access, E-mail, and the Microsoft Internet Explorer or Mozilla Firefox Web browser, and the following required text, which should be purchased prior to the beginning of class:10 More Actual Offical LSAT Prep Test published by the Law School Admission Council. "I have had 3 courses for learning how to score well on the LSAT (Kaplan, Princeton, Law School Admissions Council). Lesson 5 of this course has shown me that there is a light at the end of the tunnel:-). The instructor makes it clear and not overwhelming. At the end of the other courses, I still felt nervous about taking the LSAT. After both of these courses, I feel sure that I will be ready." "Words cannot express how much I truly appreciate your LSAT Courses both part I and II. I have learned more in your courses than in all the LSAT courses I've taken in the past. I had periods of tension, but nothing like what I experience in a classroom. I prefer online studies than classroom…Thank you once again and all your staff members. You really improved my knowledge in understanding the LSAT." ExpertRating is one of the world's only ISO 9001:2015 Certified companies (from TUV America) offering an Online LSAT Test Prep -II Course (leading to ExpertRating LSAT Test Prep -II Skills Certification). ExpertRating is a trusted name in online testing and certification with over 200,000 certified professionals in over 60 countries in more than 200 skill areas. ExpertRating offers its testing services to the world's best companies such as Convergys Corp, UPS, GAP, Sony, Coke, Citrix, Deltek Corp, IKEA Systems and Ericsson to name a few. See where ExpertRating Certified Professionals are working. It is very safe to buy from ExpertRating. Apart from being an ISO 9001:2015 certified company, it is a member of the TRUSTe and HackerSafe approved. ExpertRating Solutions has been reviewed by TRUSTe for compliance of their strict program requirements ensuring that your information is always safe. ExpertRating has certified Several thousand individuals who are working with leading companies across the US and other countries. View list. When you choose the ExpertRating Online LSAT Test Prep Course-II you can be sure that you are buying a premium International certification that is recognized by hundreds of employers and Government bodies in the US and other countries. With ExpertRating you get certified quickly online and you are equipped with a store house of information through the in-depth ExpertRating Online LSAT Test Prep Course-II Courseware which has been developed by experienced Law Experts. 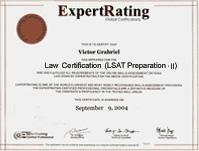 The ExpertRating Law Certification is by far the best value for money instructor led Law Program at $129.99. How much does the Law Certification cost and what does it include? You can buy this ExpertRating Online LSAT Test Prep Course-II leading to Law certification at a special offer price of only $129.99 which includes the in-depth ExpertRating Online LSAT Test Prep Course-II Courseware and exam fee. This is the best value for money Law Program available till date. You get the following services within the USD $129.99 fee. In-depth ExpertRating Online LSAT Test Prep Course-II Courseware including scenarios and case studies. An instructor to guide you through the course and to whom you can direct your questions. World wide airmail delivery of the hard copy Law Certificate. The Law Certificate can be used to prove your certified status and does not mention the words "online". An online transcript that can be used to prove your certified credentials on the internet at any time. The process of getting yourself certified is very simple. All you have to do is buy the ExpertRating Online LSAT Test Prep Course-II for $129.99. Log in to the instructor led course using your password. Go through the ExpertRating Online LSAT Test Prep Course-II Courseware (which would take you 6 weeks) and complete the final Law Certification exam at your convenience. You can complete the exam within 2 months of buying the Law Certification. The result of the exam appears as soon as it is completed, and your Law Certificate is mailed immediately. What learning aids will I get? Chapter assignments to help you practically use the Law skills that you will learn during the Law Course. What is the final exam like? The final exam is fully based upon the ExpertRating Online LSAT Test Prep Course-II Courseware that is provided along with the Law Certification. If you have gone through the courseware properly you should not have a problem clearing the exam. The exam consists of multiple choice questions from all chapters of the ExpertRating Online LSAT Test Prep Course-II Courseware. What are the course start dates? ExpertRating instructor led courses commence every month, you can always choose a suitable date for your course commencement in any month. To see available course start dates, please click on the "Enroll now" button. All courses run for six weeks, with a two-week grace period at the end. Two lessons are released each week for the six-week duration of the course. You do not have to be present when the lesson is released, but you must complete each lesson within two weeks of its release. A new section of each course starts on the second or third Wednesday of each month. If enrolling in a series of two or more courses please be sure to space the start date for each course at least two months apart. You can master the methods and techniques of LSAT with this easy to learn and comprehensible LSAT Preparation Course. LSAT is a standardized test for applicants who wish to take admission in a law school. The test is administered by the Law School Admission Council four times a year. The score in the LSAT is the most important factor during the application process for a law school. The LSAT Preparation course will contain useful information about the type of questions, law school surviving techniques and the test taking strategies. This is a valuable course for law school applicants and who wish to pursue law as a career in the future. The ExpertRating LSAT Preparation Certification course will provide you the most personalized, efficient and effective preparation for getting admission into a good law school. You may have heard that you can't study for the LSAT. But that's just not true! There are a bunch of general things you can do to prepare for the LSAT, and the more time you spend preparing, the better your scores will be. In this first lesson, you'll learn how to relax when you start feeling panicky on test day. This lesson will also review specific tips on how to approach LSAT question types, how to eliminate the wrong answers the tests try to entice you to choose, how to guess when you're not sure of the right answer, and how much time to spend on each question. After you've completed this lesson, you'll be ready to learn more about the specific questions, starting with reading comprehension. You've been reading since first grade, but that's not enough experience to get you ready for the LSAT reading comprehension passages. There's more to these babies than just reading a passage and working through its questions, and this lesson will go over the tools you need to develop your own personal reading strategy. You'll glide through even the most sleep-producing reading topics by focusing on what's important and ignoring what's not. You'll see how to eliminate answers that hook other unprepared test-takers. And you'll find out how to spot the distracters the test-makers use to make wrong answers seem right. LSAT reading comprehension questions fall into three major types: main theme synthesis, specific information, and inference. This lesson will take an in-depth look at the characteristics of and approaches to each of the question types so you'll know how to recognize them and handle them with ease. Reading LSAT passages isn't the same as reading for pleasure or even reading for school. This lesson will go through some time-tested techniques for approaching passages. This lesson will go over what to do while you read the passage to prepare yourself for each LSAT reading question type so when it comes time to provide answers, you're all set! In this lesson, you'll draw on everything you've learned about reading comprehension so far and put it all together. Through careful analysis of previous LSAT reading passages, you'll develop a system for the reading comprehension section that allows you to focus on what's important and overlook what's not. You'll move through the section more quickly than you thought you could! Because practice makes perfect, this lesson will continue to instill the concepts you've learned so far by thoroughly examining another reading comprehension passage from a prior LSAT test. You'll find out exactly how to read through the passage and how to methodically approach each question. You may not have seen the LSAT logical reasoning questions before. Even though they may be unfamiliar, by the time you've completed this lesson and the next few, you'll know just how to tackle them. They may just become your favorite LSAT test questions! This lesson will review the elements of a logical argument and the major types of inductive arguments you'll see on the LSAT. There are several different types of logical reasoning questions. This lesson will take an overview of all of them: strengthen or weaken conclusions, drawing conclusions from premises, assumptions, inferences, and method of reasoning. You'll learn how the general qualities of each question type and how to recognize each one in the LSAT logical reasoning section. This lesson will get into a little more detail about how to answer questions that ask you to strengthen or weaken conclusions and questions that ask you about methods of reasoning. You'll learn how to pick out the type of argument the author makes and choose the best answer based on the author's manner of reasoning. In this lesson, you'll give the same amount of attention to drawing conclusion, assumption, and inference questions that you gave to the other two logical reasoning question types in the prior lesson. Through examining and analyzing sample questions, you'll learn just how to master these three LSAT logical reasoning question types. This course wouldn't let you escape without a little practice! This lesson will completely examine how to approach and answer all types of logical reasoning questions from prior actual LSAT tests. You'll get a step-by-step guide to doing your best in this section. With this proven strategy, you may even find that you're answering all of them correctly.